You can share any of your Exchange Server account contact folders with another person who is also using an Exchange Server account in your organization. If supported by your organization’s sharing policies, you may also be able to share a contacts folder with people outside your organization. For example, you can share your contacts folder with people. Or, you can create a new contacts folder for a specific project and share it people. You can also grant them permission to change the contacts. This feature requires a Microsoft Exchange Server account. Sharing or viewing a shared contacts folder is not supported in Outlook on the web. Create, read, change, and delete all items and files. Create and read items and files, and change and delete items and files that you create. Create and read items and files, and delete items and files that you create. You have no permission. You can’t open the folder. You can create custom permissions by selecting the appropriate check boxes and options under Permissions. When you use Microsoft Outlook with a Microsoft Exchange Server account, contacts can be shared between people. 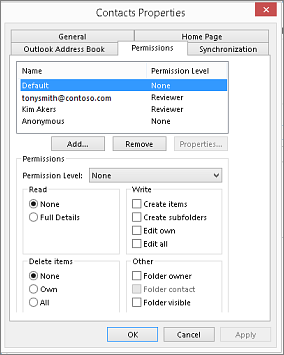 Contact sharing is not limited to the default Contacts folder that is created in all Outlook profiles. You can create additional contacts folders and choose which of those folders to share. For example, you can create a contacts folder for a specific project and share it with your coworkers. Optionally, you can grant them permission to modify the contacts. Tip: Any message, contact, or task in Outlook can be marked private so that others don't see the item in a shared folder. Contact sharing works through sharing invitation and sharing request e-mail messages. 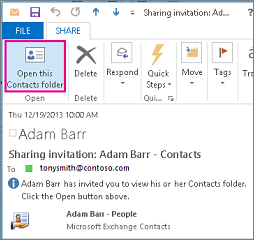 Sharing invitations offer the recipient access to your contacts folder. When you send a sharing invitation for your default Contacts folder, you can request access to the recipient's default Contacts folder. Note: If you want to request access to an additional contacts folder that the recipient has created — not the default Contacts folder — you must send an e-mail message asking for permission to access that folder. The recipient can then send you a sharing invitation for the specific contacts folder. If you want to, request permission to view the recipient's default Contacts folder. To do so, select the Request permission to view recipient's Contacts folder check box. Note: If you want to request access to a contacts folder other than the default Contacts folder, you must send an e-mail message asking for permissions to that particular folder. This option only requests access to the recipient's default Contacts folder. In Contacts, in the Navigation Pane, under My Contacts, click Contacts. Under Permissions, in the Permission Level list, click None to revoke permissions or any of the other options to change permissions. Repeat step 2 for each person whose access permissions you want to modify. When you use Microsoft Office Outlook 2007 with a Microsoft Exchange account, contacts can be shared between people. 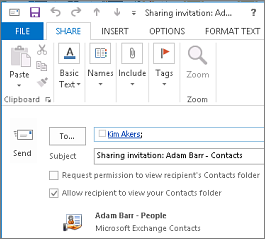 Contact sharing is not limited to the default Contacts folder that is created in all Outlook profiles. You can create additional contacts folders and choose which of those folders to share. For example, you can create a contacts folder for a specific project and share it with your coworkers. Optionally, you can grant them permission to modify the contacts. In Contacts, in the Navigation Pane, click Share My Contacts folder. Note: If you are using the Navigation Pane in Minimized view, in Contacts, click Navigation Pane, and then click Share My Contacts folder. In Contacts, in the Navigation Pane, right-click the default Contacts folder. This is usually under My Contacts, and is displayed as Contacts. If you are using the Navigation Pane in Minimized view, in Contacts, click Navigation Pane, and then right-click the default Contacts folder. This is usually under My Contacts and is displayed as Contacts. On the Permissions tab, in the Name box, click Default. In Contacts, in the Navigation Pane, right-click the contacts folder that you want to share. Note: If you are using the Navigation Pane in Minimized view, in Contacts, click Navigation Pane, and then right-click the contacts folder that you want to share. In the To box of the sharing invitation, enter the name of the recipient. If you want to, change the Subject. If you want to, grant permissions to the recipient to change your contact items by selecting the Recipient can add, edit, and delete items in this contacts folder check box. Review the confirmation dialog box, and then, if correct, click OK. In Contacts, in the Navigation Pane, right-click the contacts folder for which you want to change permissions. Note: If you are using the Navigation Pane in Minimized view, in Contacts, click Navigation Pane, and then right-click the contacts folder for which you want to change access permissions. On the Permissions tab, in the Name box, click the name of the person whose access permissions you want to change.